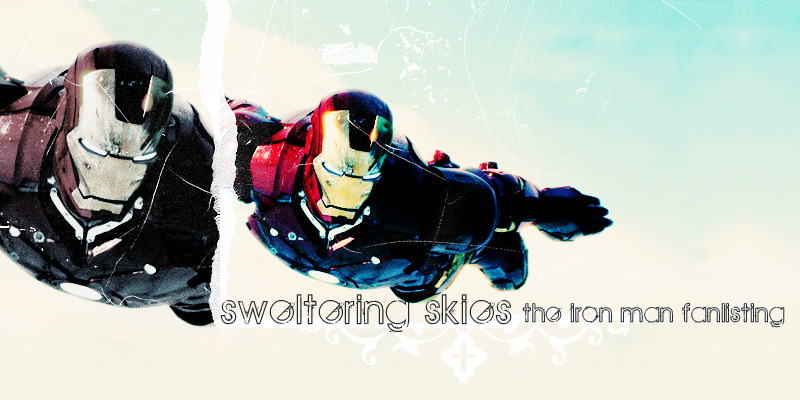 Welcome to Sweltering Skies, the fanlisting for the 2008 Marvel movie, Iron Man, listed at The Fanlistings Network. This movie was directed by Jon Favreau, and stars Robert Downey Jr. as Tony Stark, or Iron Man. If you love this movie, please consider joining this fanlisting. A fanlisting is a small site that collects a list of fans for a particular subject. Everything except Anime and manga related subjects are listed and regulated under The Fanlistings Network. For anime and manga fanlisting, visit The Anime Fanlistings Network. Sweltering Skies was opened on 10 Jun 2008 and last updated on 29 Mar 2019 with a total of 211 (+0 pending) members, from 34 countries. The newest member(s) is Ai~. Powered by Enthusiast. Layout & fanlisting by Masao. All images copyright to Marvel. Part of the Erosion Network & Glorious.